“While Mawson can experience regular blizzards, the conditions over the last few days have been moderate, with wind gusts of up to 40 knots,” he said. The turbine was built by the German company Enercon, and went into operation in 2003. “The cause of the incident is unknown and will be fully investigated,” said Wooding, adding that regular maintenance was carried out on the turbines. Mawson, named after polar explorer Sir Douglas Mawson, is one of three Australian bases in Antarctica. Established in 1954, it is the longest continuously operating station south of the Antarctic Circle. ‘only moderate gusts of wind at the time’ – so wind at the time not the likely cause. Possibly wear and tear, or maintenance mistake/omission? Not many wind turbine service engineers in Antarctica. A long way to go to work on only two turbines. They should have used coal – much more reliable. How far have they put off limits because of contamination? If nuclear had been used would the evacuation zone be less? Nothing about the temperatures experienced since installation. Surely that has got to be a lubrication nightmare for the turret. It also looks like the mast was installed too close to the building. It may never come down, but then if it does…. If it is engineering it is susceptible to failure, – nothing is immune and one learns to trust no one from design to operation. 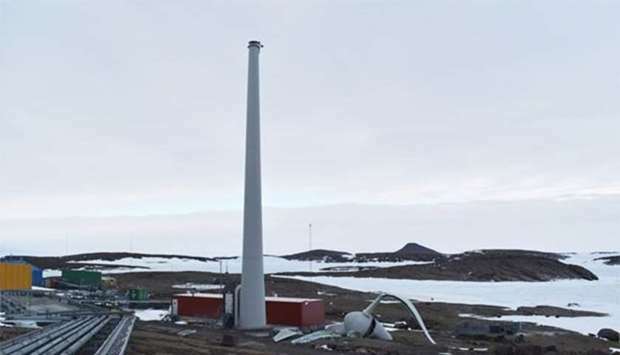 Wind turbine at remote station is an excellent application of the technology. Not so much here. Locally, one liberated its blades just missing a chap walking his dog. We have also had two burn themselves to the ground, one of which was only months old. You can’t say life isn’t exciting near wind turbines. Quoting pg sharrow “The “flap” of the blades as they pass the pylon….” That brings memories. Plenty of trouble, but also a career maker for any maintenance engineer. Sort of ‘flutter’, experienced in turbine blades and boiler tubes (or aircraft wings ). New data relating to the sale of a 50% share in the Walney Offshore Wind Farm extension project confirms the conclusions of the GWPF’s recent study, ‘Offshore Wind Strike Prices: Behind the Headlines (2017)’: offshore wind capital costs are not falling, and appear to be rising due to the costs of construction in deeper water. @ oldbrew; Wait until they get to the real cost of maintenance. The investors will feel like a bunch of plucked turkeys. Their only escape from that cash drain will be to sell or declare bankruptcy. I’ll bet the rate payers will be sold down the river by their politicians to keep the lights on by nationalizing the ever increasing cost. The cheapest out is to scrap the wind turbine projects at ANY cost and get on with the only solution to providing Dependable, Affordable, electrical power. Nuclear power generation is the only proven solution to powering future civilization needs.